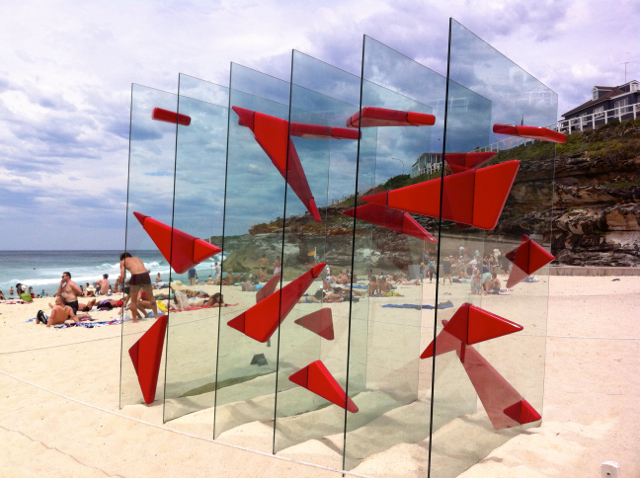 Every year, thousands of people flock to the coastal walk between Bondi and Tamarama beaches to check out the art installations as part of Sculpture by the Sea. The path that hugs the coastline between these two beaches is spectacular, overlooking the deep blue ocean, golden sands, and steep cliffs, and it is always popular with walkers and joggers. The day we chose to visit this year was baking hot. 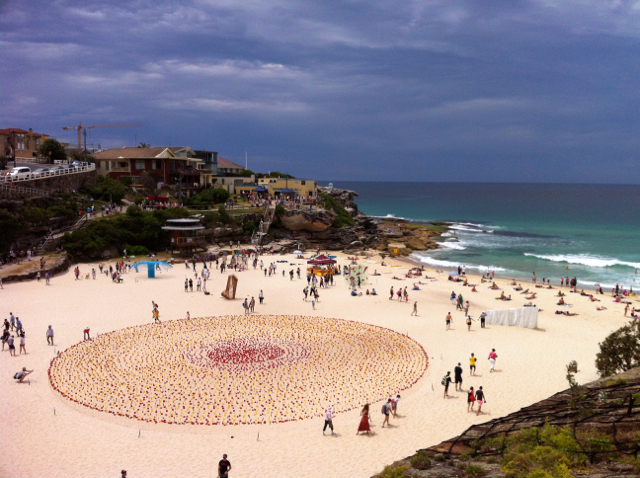 After a big breakfast at a Bronte beach cafe, we strolled north to Tamarama where we were greeted by this massive installation on the sands. Very striking and spectacular from above! 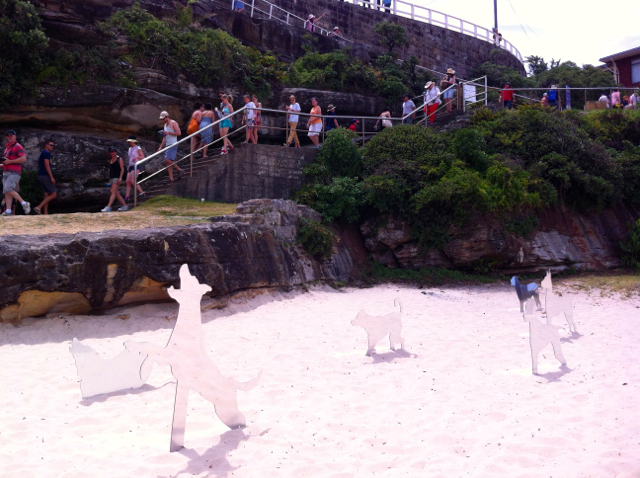 We had a look at some of the other sculpture installations on the beach, and dipped our toes into the refreshingly cold water. 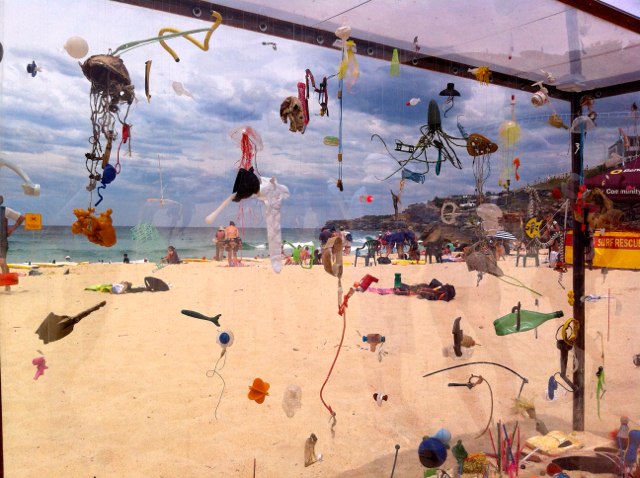 I particularly liked this one above, with pieces of trash masquerading as jellyfish. As a diver and beach goer, the amount of human-produced garbage that ends up in our waters is staggering, and it can have a devastating effect on wildlife. Due to the heat and the jostling crowds, we lost all motivation to continue onto the full length of the walk. 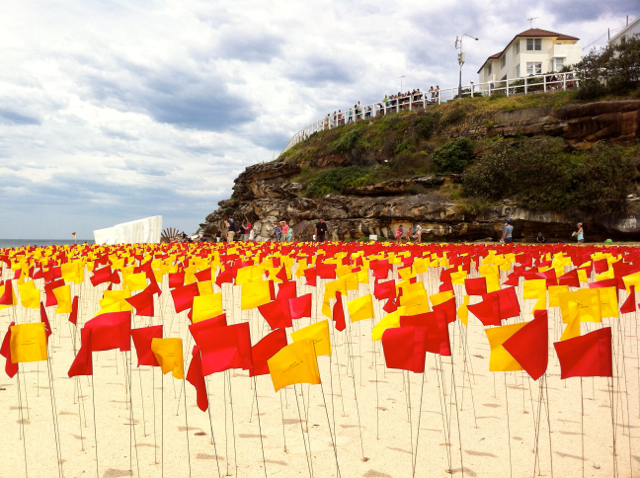 From outings in previous years, this event is definitely a highlight, marrying art and the beautiful Sydney seascape, which is a perfect introduction to art for an ignoramus like myself! October is one of my favourite months of the year. It’s spring, the weather is warming up, and the days are getting longer. Best of all, it’s Good Food Month, which means lots of special food events, and an excuse to taste lots of different foods all around Sydney. Most of the events are in the city, and it’s a shame that I don’t work in town to take advantage of all the lunch specials. 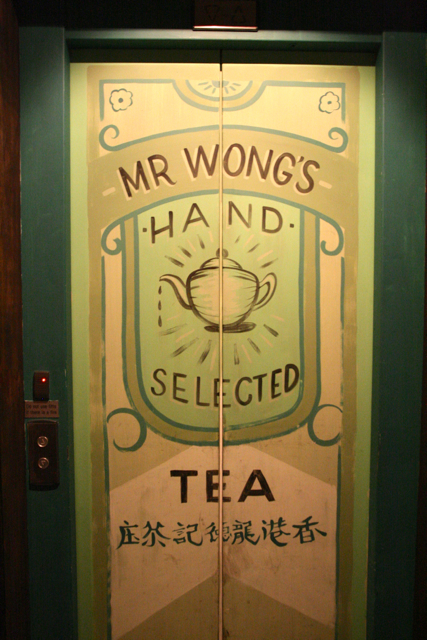 Regardless, I managed to make it to a couple of restaurants that I have been meaning to try, including Mr Wong. 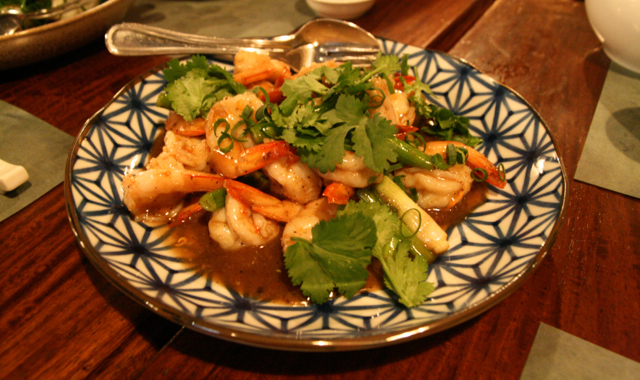 This funky Cantonese-style restaurant has had an amazing year, being crowned Best New Restaurant by both the Good Food Guide and Time Out, and winning two chef’s hats in the Guide. 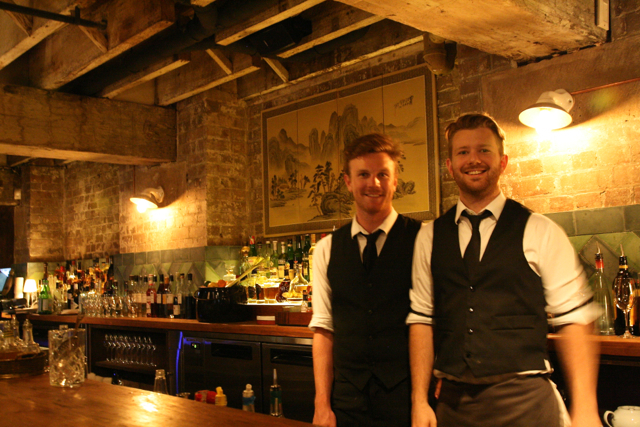 The decor transports you to an old Chinese opium den, with exposed brick and timber, and dim lighting. The service is friendly and eager to ensure a seamless experience. The bar staff are also very handy at dishing up some delicious cocktails too, if that’s what you want with your dim sum! The menu for this “surprise” lunch was a mix of treats from their existing menu, but some special guest appearances as well. We started with a leafy salad of cucumber, fennel, woodear mushroom with chewy glass noodles, before each of us received our individual mini bamboo steamers with plump dim sum. The dim sum here are exquisite, and you would expect no less from the master himself, Eric Koh, from the globally successful Hakkasan and Yauatcha. 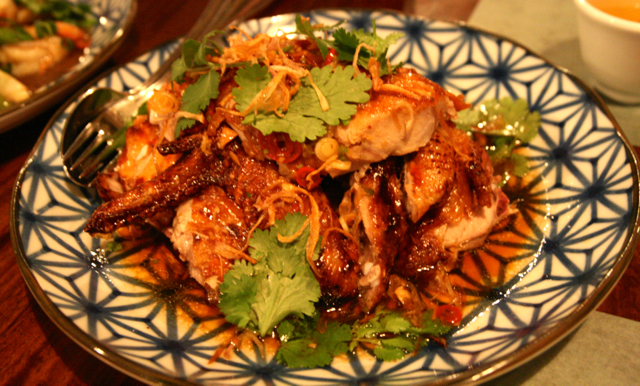 Succulent and juicy, and left us wanting more. Stir fried corn kernels were a surprise. 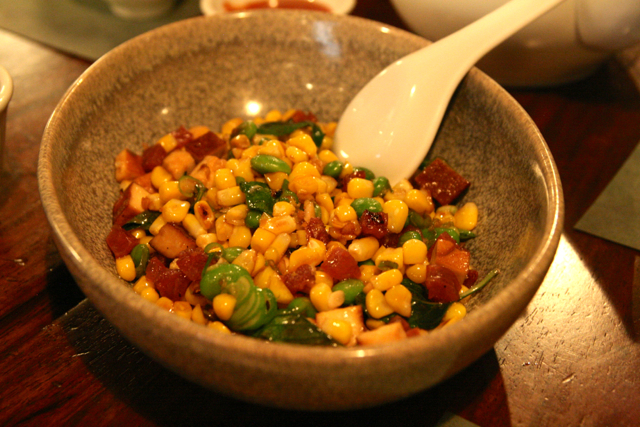 I don’t think I’ve ever seen corn in a Chinese restaurant, except for those tinned baby corn spears, but this was very good. Then again, anything with lap cheong, the deliciously fatty Chinese sausage, is guaranteed to be a winner. 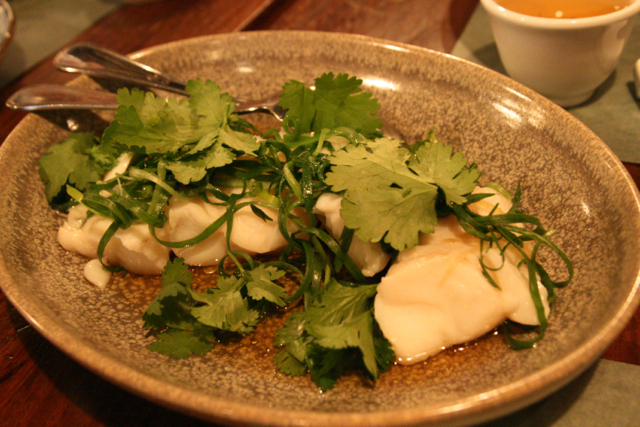 The mains were a lot more familiar, with lovely, delicate steamed fish with ginger and shallots, stir fried king prawns with black pepper and garlic, and a fantastic crisp-skinned Shandong chicken, which is twice cooked with a black vinegar sauce. 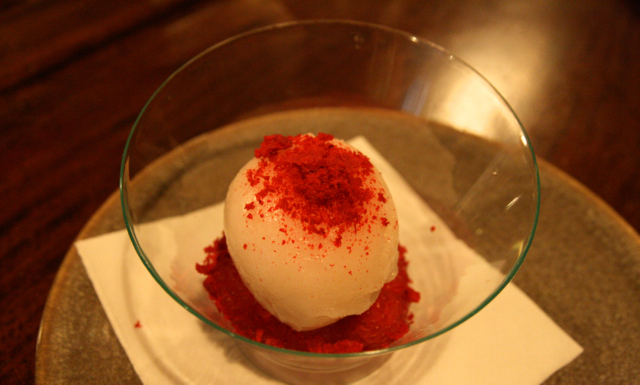 The perfect finish to our meal was a light and refreshing lychee sorbet with raspberries. We had a wonderful time here, thanks to the stream of surprise dishes (we hadn’t seen a menu), the attentive service, and the fantastic atmosphere. For $55 a head, I thought it was very good value, since we were well and truly stuffed, although I think that the a la carte menu could get way out of hand pretty easily. 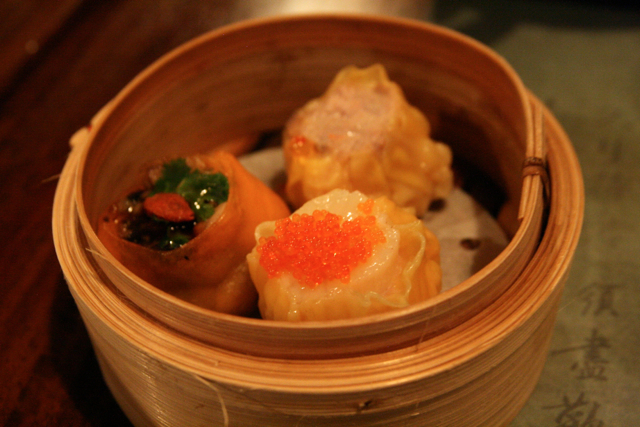 Having said that, I’m looking forward to coming back here one lunchtime to take the dim sum menu out for a spin.